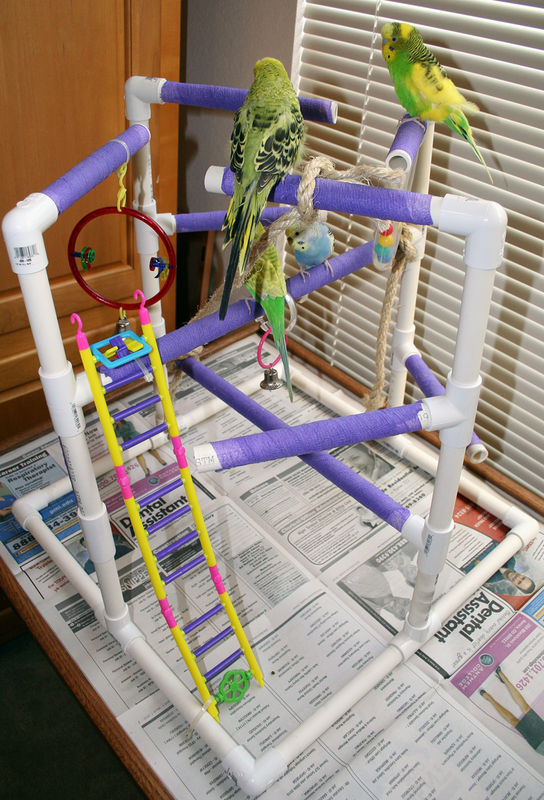 I’m an avid bird lover, my husband is a plumber and together we make table-top playgyms, stands and perches for your birds’ entertainment and exercise. Our feathered family members ADORE their play gyms! Because they’re lightweight and portable, we move them to the dining room for dinner, the living room to watch movies with us, and the bathroom for showers and mirror time. Just place a layer of newspaper under the base and presto, you can place your playgym virtually anywhere. Your birds will love spending more time with you and out of their cage! 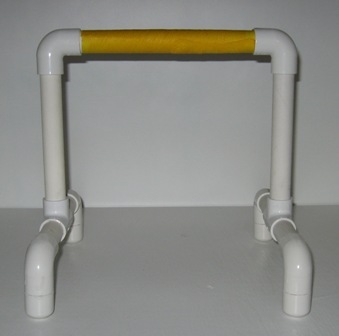 We use construction grade schedule 40 PVC pipe and fittings for an extremely durable product. Unless specifically requested otherwise, a minimum of glue is used on the base fittings to make the unit stable. To prevent accidental ingestion, the perch fittings (where the bird comes in contact) are NOT glued — instead, those fittings are pushed firmly together. Colorful vet wrap is used for maximum foot comfort, grip, and traction. 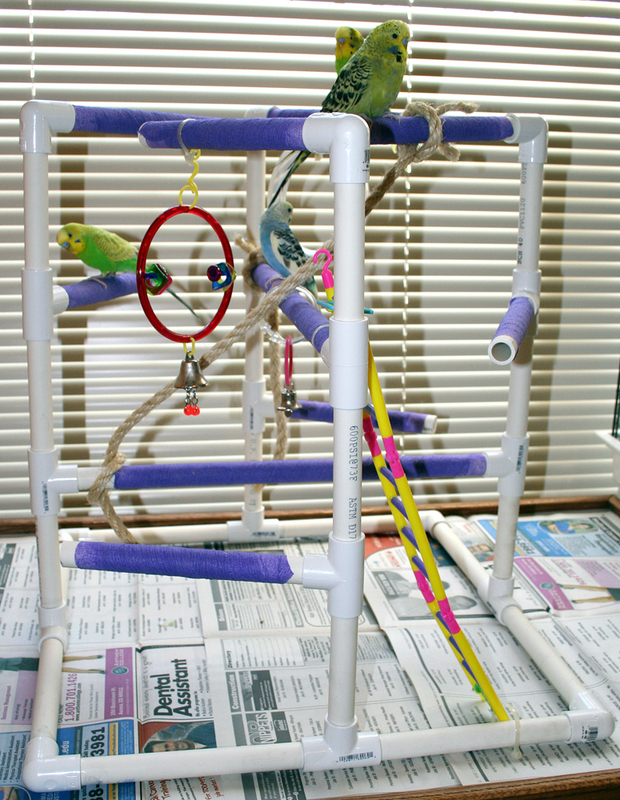 Toys pictured on the playgyms are not included — you may affix your bird’s favorite toys easily using zip ties. Play gyms can be picked up fully-assembled in Fort Collins, Colorado. We also ship: Shipping costs are paid by the buyer; some assembly will be required (we label each pipe and fitting to make it easy for you to push together — no tools needed). 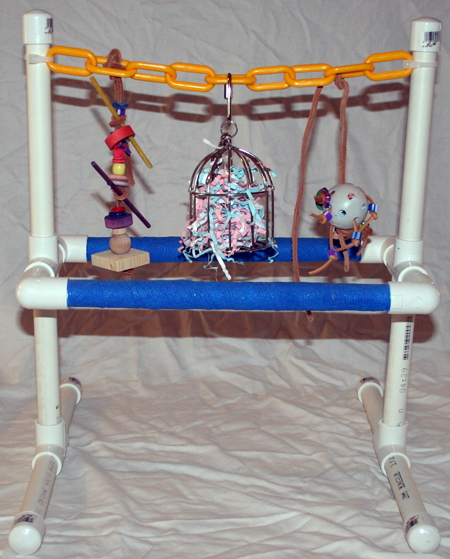 “Toy Center” Small Bird Playgym: Two perches and center chain for hanging toys (toys not included). $29. Table Top Perch: $19 for small birds; $25 for medium birds; $29 for large birds. 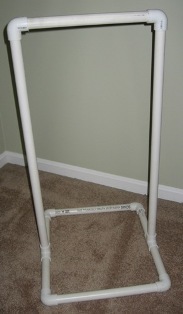 Tall Perch Square Base: Great for showering and training. Available in custom sizes — contact for quote. We can accommodate custom sizes, configurations and wrap colors — please email us to discuss the possibilities! Email: Jen @ Puppies Are Prozac . com (remove all spaces from the address first). 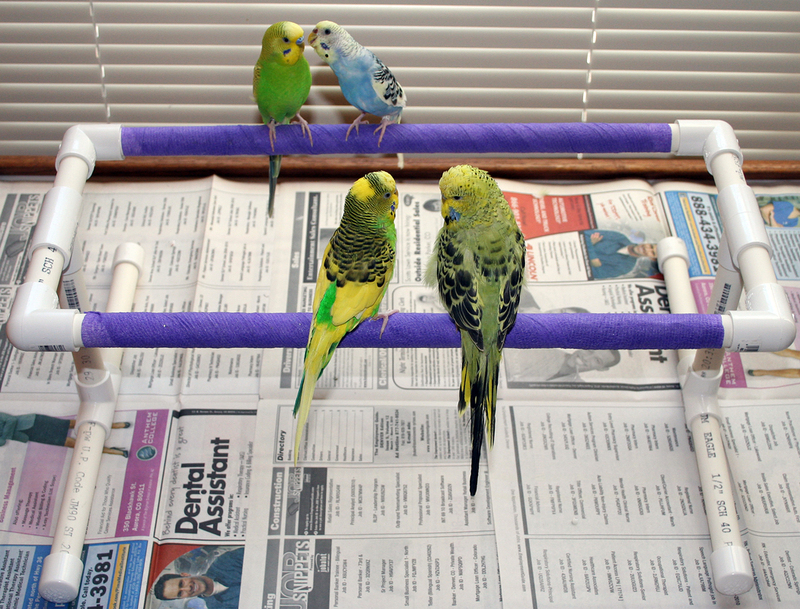 Amanda, see this page on our website: http://puppiesareprozac.com/budgie-parakeet/bird-supplies/. Thanks! Hello, my name is Pam. I live in Colorado Springs,Co,and I don’t know if you got my first message.However I just bought two Parakeets,both from two different places. One is four months old, and the other about six to eight. they are not hand trained and I have looked on you page for guidance.My problem is that they only want to eat seed, and I would like them to eat other foods. they are’t interested in ANYTHING I give them.I’m frustrated because I can’t hand train them and they wont eat what I serve them. Can you help me? I would appreciate a call if you have the time. Great site here! 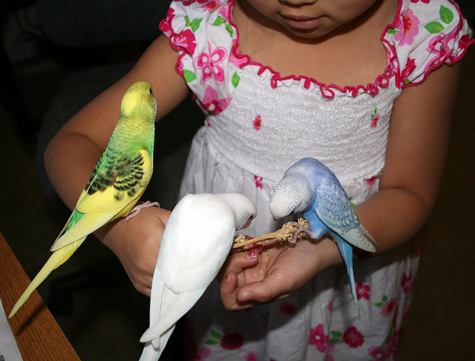 We learned so much about our little friends’ (parakeets) needs and care. Thank you! The link says learn how to make your own, but I can’t find the plans. Are the plans available for purchase? Thanks! 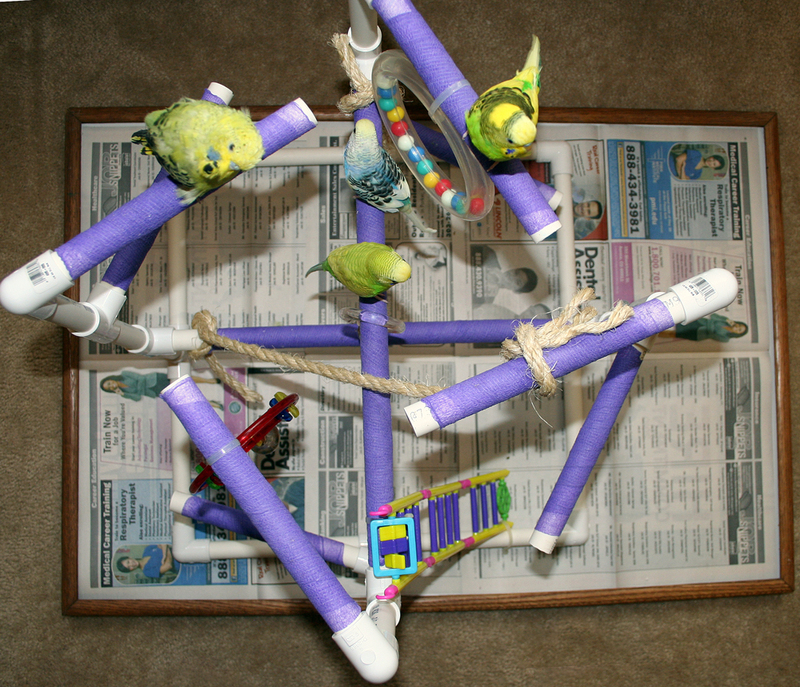 Is it safe to make perches/a playgym for my parakeets out of branches/twigs? Loved your site.So informative.I started growing parakeet seed by accident.Some seeds fell into one of my house plants and after a few days they grew.Is sprouting in water better?I had no idea 💡parakeets could eat so many things.Thank you for all this information.